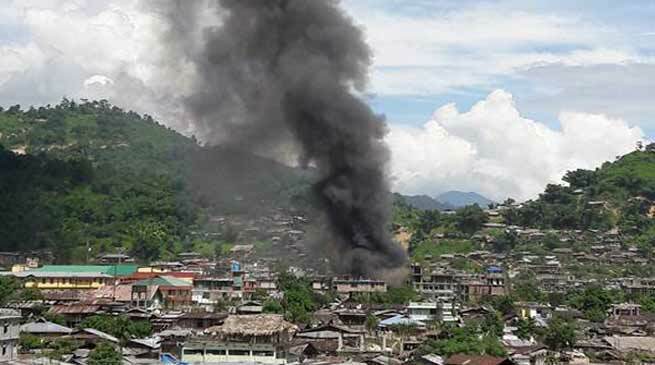 Chief Minister Pema Khandu has expressed shock and grief over the fire mishap at Daporijo, headquarters of Upper Subansiri district that reportedly gutted down many shops and rented houses in the main market area of the township today. On receipt of the information, the Chief Minister spoke to Deputy Commissioner Upper Subansiri and sought immediate report from the district administration and directed it to put all available resources for relief and rehabilitation of the victims. Upper Subansiri deputy commissioner reported that about 87 families have been rendered homeless due to the inferno. While no casualty has been reported, the actual cause of the mishap is yet to be ascertained. Khandu appreciated the district police, ITBP, CRPF, GREF and members of the market committee for lending help in relief and rescue operation. According to the district administration three numbers of fire tenders were pressed into service to douse the fire. Victims have been temporarily sheltered in DUDA market complex building that have been turned into make-shift relief camp. The Chief Minister has directed the district administration to provide immediate relief materials to the victims while asking it to press all concerned departments to render logistics in the designated camps. He assured the people and victims that the government will provide all support in their relief and rehabilitation while directing the concerned department to release immediate relief as per norms. He has also sought detail report on the damages caused and loss of property in the inferno. Khandu reiterated his appeal to the people to remain extremely cautious to avoid such mishaps. “I repeat that such mishaps are due to human negligence which can be averted with simple precautionary measures. Please do not neglect simple do’s and don’ts to prevent fire accidents,” he appealed.